The Revvi bike has been on my list for a while as there are not many good quality bikes which actually perform designed for ages 3-5 (the revvi goes up to 8 which is a very big age range so it's much better value than other ones for ages 3+). I got the full set including the gloves and helmet and my already high expectations have been more than met. 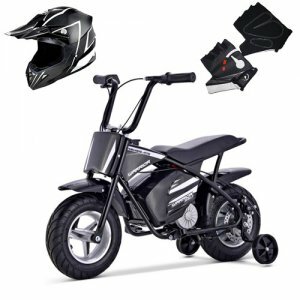 The bike is very well made with sturdy metal chassis and real inflatable rubber wheels. I was expecting it to have solid wheels with rubber coating so this is a huge plus for me. braking is powerful and smooth and the accessories really give it a profeessional edge. The Revvi has now been out with me on two trips into Thetford Forest and the boy loves it. We've got a lot of jealous looks from other kids too! Brilliant product, quite hard to find but Kids Electric Cars sorted me with no hassle, reserving me one of their new stock. 5 stars!